@heatworld: We've been partying with @lindsaylohan at the #terryrichardson party& just spotted a very loved up R-Pattz & K-Stew at the Chateau Marmont! @heatworld: Oh, and we spotted Jennifer Aniston and Justin Theroux earlier. They just might rival K-Stew and R-Pattz as Hollywood's hottest couple! 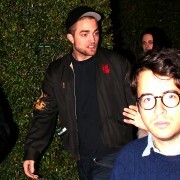 @deanpiper: And R-Patz and Kristen Stewart looked super super loved up at Chateau Marmont too. Like his short hair. Both chain smoking in a corner.